Despite the very poor start of the baseball season, my favorite baseball team the Minnesota Twins have gotten back into the swing of playing ball and are on a roll. Yet so are the Detroit Tigers and the Chicago White Sox. Being 11 games out of first, it's tough to get excited to watch them, but they have just had an outstanding month of June, yet so have the Tigers and White Sox. This photo is from the Seattle game played earlier in June or the very last week of May. The Twins are on the field and Johan Santana is the pitcher on the mound. 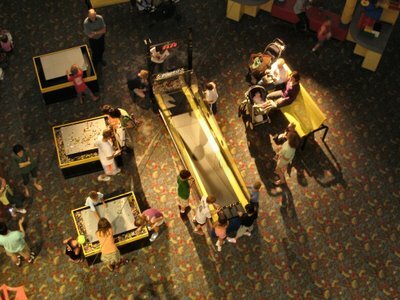 Looking down into the Lego building area from above on the third floor landing at the Mall Of America. The kids are building cars and racing them down the ramp. They have legos set up in this area for all age of children. My two kids could spend hours here building cars and racing them. It's quite an art to get the weight, length, strength to win these fun races. I taught them well. I've only rode on the light rail one time so far since it has been in operation. It was quite smooth, but it was before a Minnesota Vikings game and the car was completely packed with people. 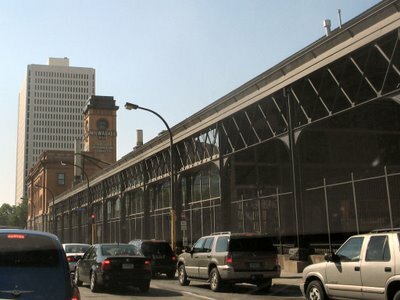 The light rail runs from the Mall Of America into downtown Minneapolis with many stops in between. The crazy thing is it's all done via the honor system. When the traffic is bad on 494 crossing the Mississippi River, I take an alternate route. Sometimes this works against me if there is a crossing train. When I snapped this shot, I saw the lights flashing red and the engine approaching and I had to stop and wait for the train to pass. As I was waiting, I saw something that looked like people sitting on the train. 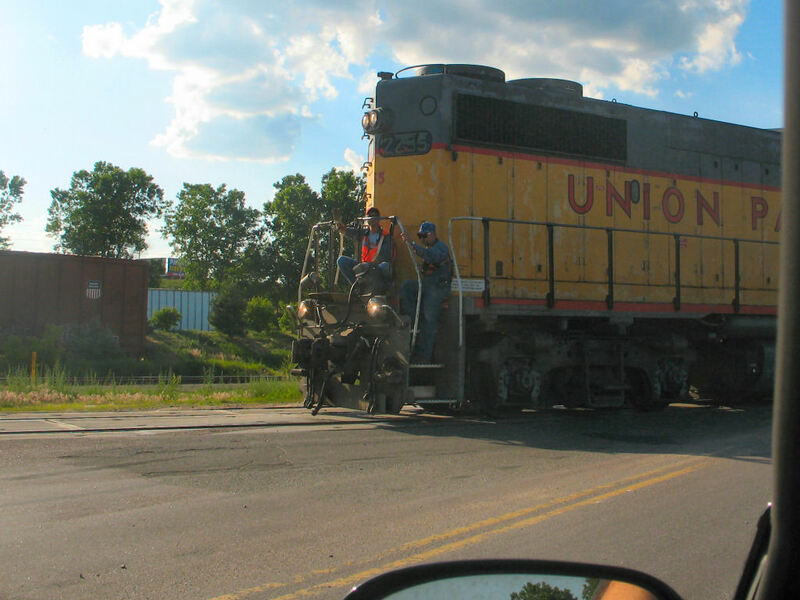 Sure enough it was two guys sitting up front on the slowly moving train. Lucky for me the train was only pulling two cars that day. The great news was I had my camera with me for this shot. Was shooting into the sun and wasn't sure how good the photo would turn out as I had to adjust the settings as quick as possible. I took the photo and waved as they passed. Was surprised to see this run down apartment building looking rather good. Amazing what a coat of paint will do to a building that looked like it had been in a previous war zone. It has a new historic plaque that says the building was built in 1883. It doesn't look too bad these days from what I can remember it looking like. 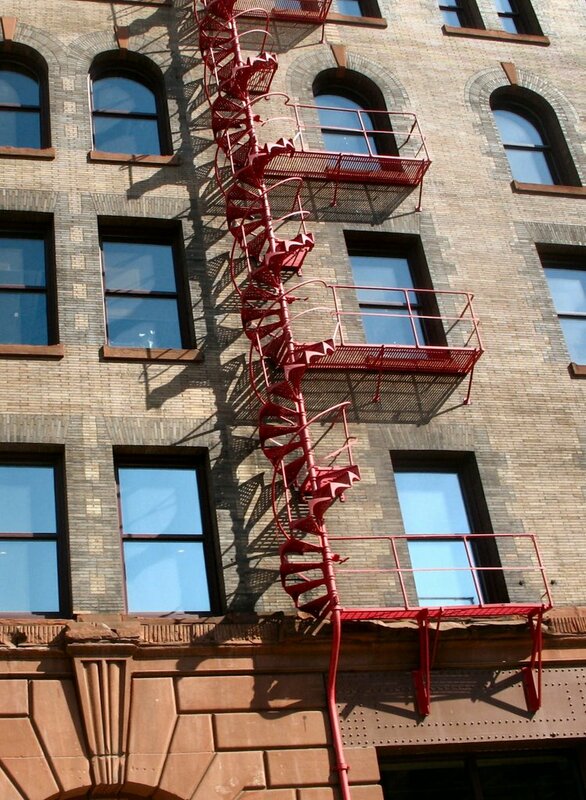 It's on the corner of Ohio Street and George Street in St Paul. These clever bird houses were for sale at a really unique store in the Mall Of America in Bloomington. Didn't catch the name of the store, but they had a TV running a video of the bird houses in action. 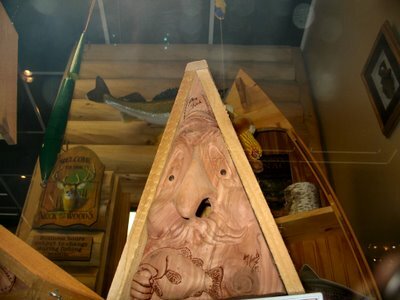 The birds would enter their nest via the nose of the bird house. It was quite comical and certain an excellent attention getter. Every one of the faces on the bird houses were differnt from each other as they were all hand carved. 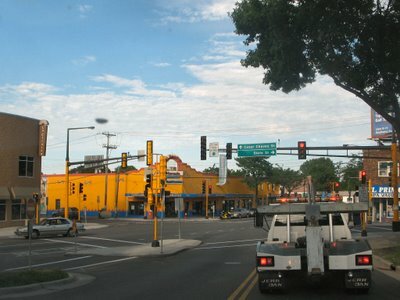 I was trying to find a photo of this intersection from 10-15 years ago, but I'm not finding anything on the interwebs that is pre-yellow paint. This used to be Concord and State intersection, not sure when that changed. 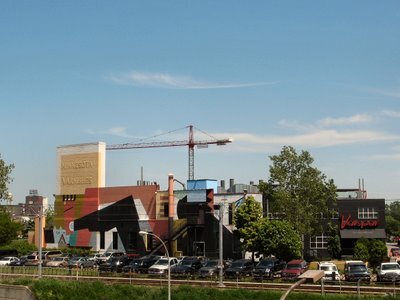 Just south of downtown St Paul, this area on the West Side is quite unique. Lots of Mexican themed stores and the community in this area are well supportive of the heritage. This entire area has been so improved, this one photo doesn't do it justice. It was quite run down when from when I can first recall living in this area. It is a very beautiful neighborhood now. For restaurants in the area, Boca Chica is highly recommended. The El Burrito Mercado grocery store in this photo has been here for quite a while. It looks like they have expanded from what I remember plus Cherokee Bank is now in the building. I certainly will have to revisit this area when I get the time for more photos. I'm headed north into downtown Minneapolis on Interstate 35W at this point. The sun is an hour or so from setting giving the buildings reflection a tad different look. 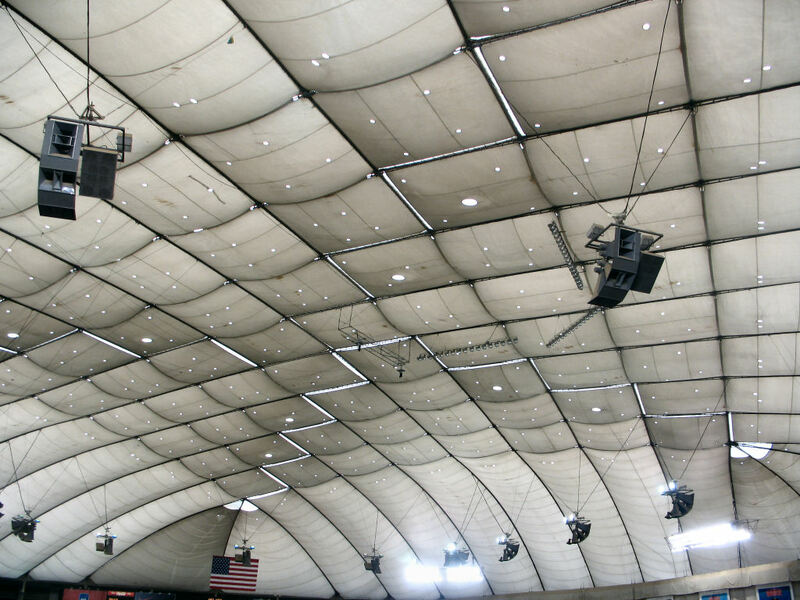 The view from inside cover of the metrodome in downtown Minneapolis. The view the cameras rarely show, unless they are heading out to a commercial break. 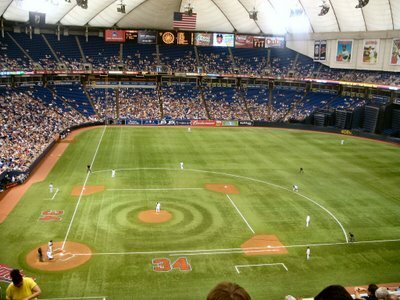 It will be sad to see the Twins move to a new outdoor stadium. 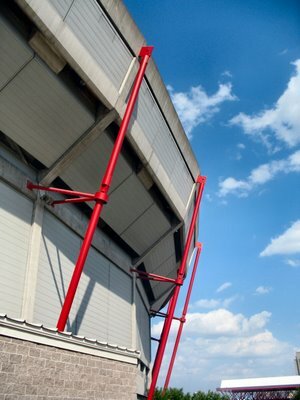 Wait, reverse that, my error, I can't wait for them to leave the indoors and move to the outdoor stadium. I wasn't a big fan of using tax payers dollars to fund the new place, yet I wasn't a fan of the dome either. 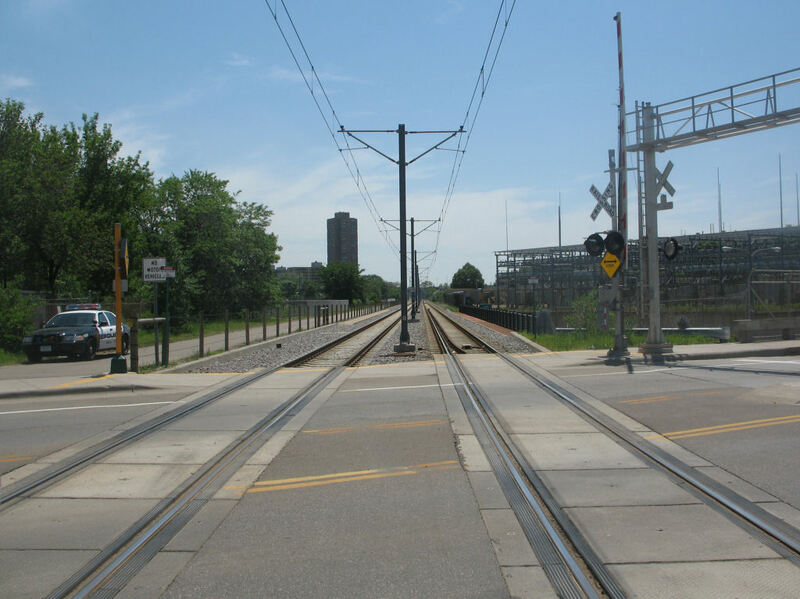 Standing on the lightrail tracks with no trains in sight. I've only been on the lightrail one time in the couple of years it's been in operation. Too bad we all are paying for something only less that 1% of the population in Minnesota is able to ride. 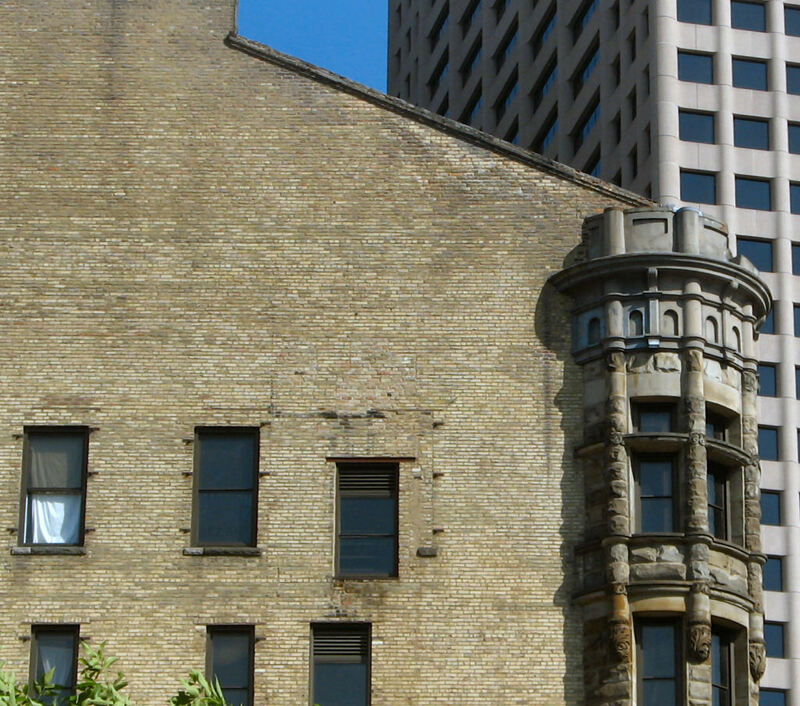 Not sure which building this is exactly from downtown Minneapolis, but I love the brick work and the round end cap to the building. I was at the Metrodome, also called the inflatable toilet, and snapped this photo of the beams that give support to the dome walls. The red beams just pop out of this photo and it is today's daily photo. I'm not sure what road I am on, but it is right along the bluff on the West Side. This is a beautiful skyline of downtown St Paul with the Capitol in view, but there is so much that is not seen in this photo. Many of which have been part of my daily photo journey. The Mississippi River is below, Sheppard Road is across the river from here. The Xcel Energy power plant is to the left of me, Wabasha Street bridge you can see, but it is hardly noticeable. The Milwaukee Road train depot sat vacant for 30 years in downtown Minneapolis. It's been recently renovated and is now used for housing, a hotel, a public ice arena and a few shops. The original clock tower is once again functional and the entire complex is preserved for years to come. 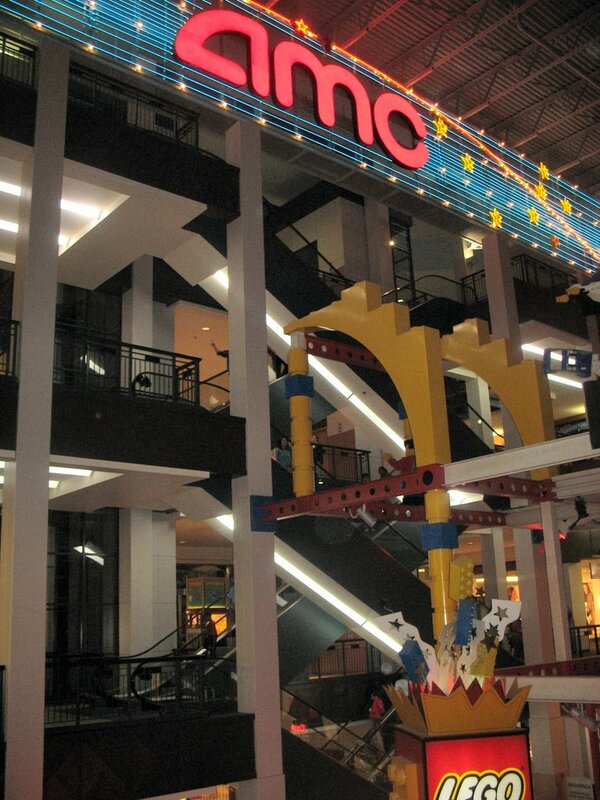 South wing of the Mall of America. 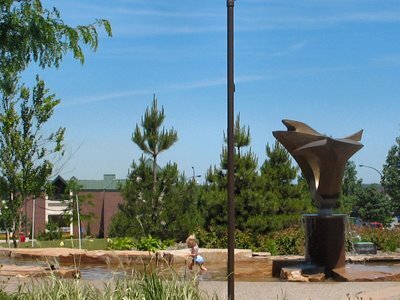 This area has a lot to offer. 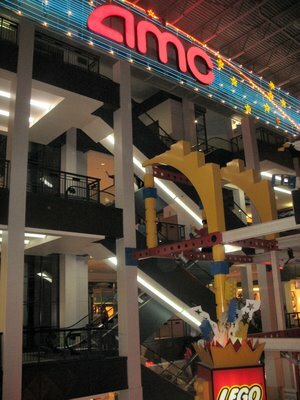 Four floors of stores and entertainment, Lego Land on the first floor reaching up to the third and fourth floors with mega lego constructions. One hundred to one hundred fifty foot wide movie theater neon light sign. Plus elevators cross crossing. Food court on the third floor here in this area too. One could just sit and watch the people here as there is much to see and soak in. 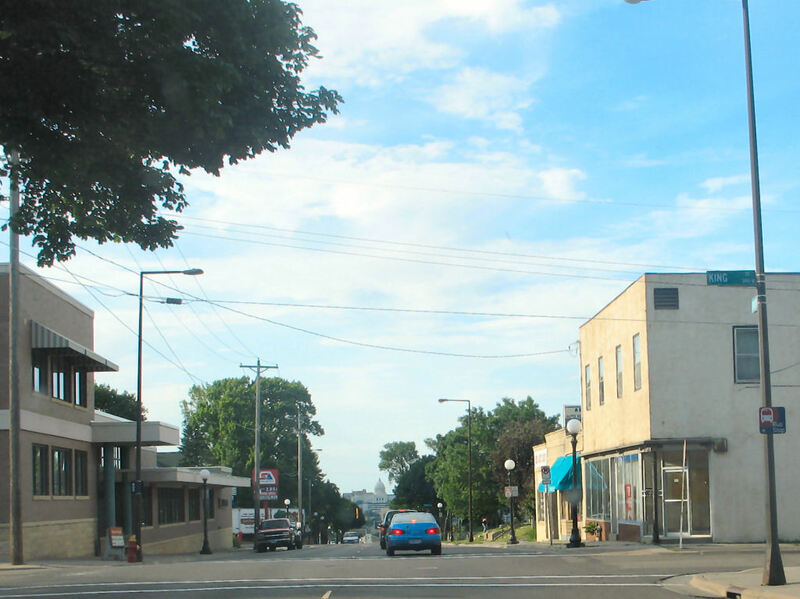 You miss so much when you are driving around the Twin Cities. 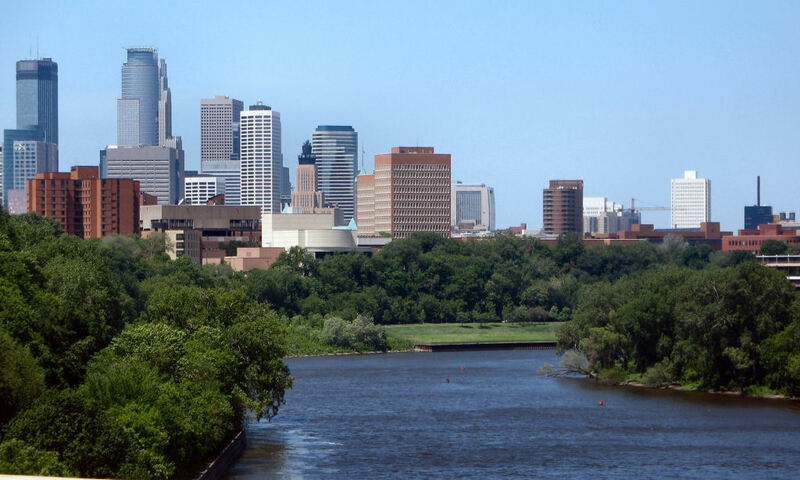 My wife took this photo as we were crossing the river from St Paul into Minneapolis on Interstate 94. I've never realized just how nice of a view this is because when you pass this area. You get about a three second glimpse, but you really have to pay attention to traffic in this area as the road winds and there are vehicles merging just before this spot. 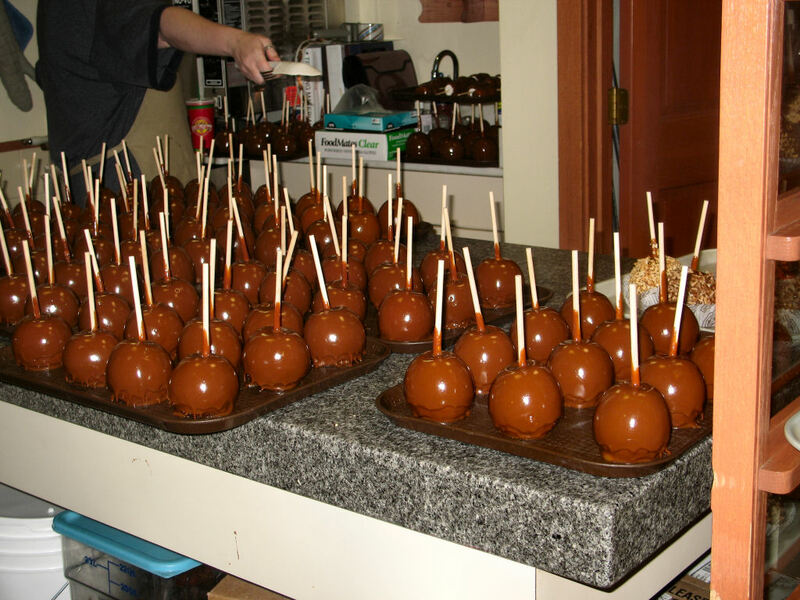 This photo could also double as a cell phone commercial where they are showing how many signal bars your cell phone has while using real objects to simulate. You'll understand if you've seen the commercial. As you drive down Smith Avenue on the 'West Side' neighborhood, you'll see the Capitol building in St Paul almost the entire drive. I'm not sure if the city planners intensionally did this or if it was just by chance. It has always been a scenic road to drive down. Was sitting at the light in downtown Minneapolis and saw the warped windows on this building and laughed at the funny images being reflected. 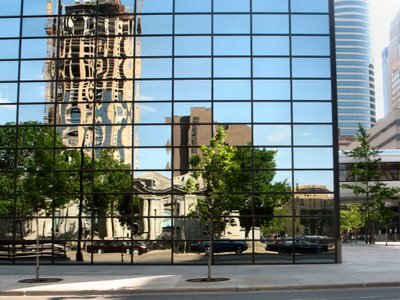 These have got to be the worst mirrored windows I have ever seen on a building. Some of the windows are not too bad, on the other hand, there are some windows that look like your watching a movie with nifty CGI liquid windows effect. Look at the building that is under construction and the size of the rooms. Not one of the black squares is even close to the same shape or size. It does however make for a crazy looking daily photo. Hands down, First Avenue is the best place to see a concert if you're ever in the Twin Cities. The price is always low, typically $10-20 dollars [US] and there are no extra fees if you purchase from a local record store. I've seen quite a few bands here when they were no so well known. The place only holds about 300-400 people I would guess and you're so close to the band you can see them sweat. If you've ever seen the Prince movie "Purple Rain" the concert footage was all filmed at First Avenue. The stars on the building exterior are all of the bands who have performed there in the past. Some notable appearances: Metallica, Queen Latifa, Joe Cocker, Billy Idol, Beastie Boys, Motorhead [seen once], Anthrax [seen twice], White Zombie [seen once before they broke up], Big Head Todd & The Monsters [seen once] and many many many more. I'd like to take a photo of all of the stars some day, but that will be down the road someday. If you ever get the chance, I urge you to see a concert here. 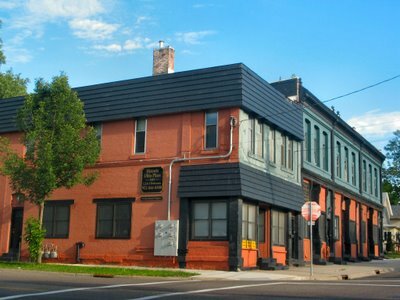 Check their concert listings at first-avenue.com and be sure to check out their history page as the building was once a Grey Hound Bus Depot. 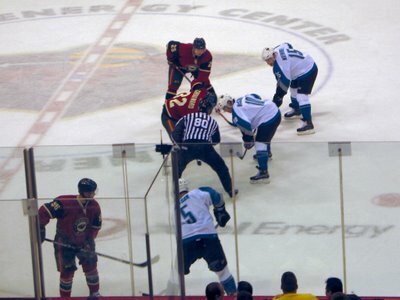 State of Hockey. 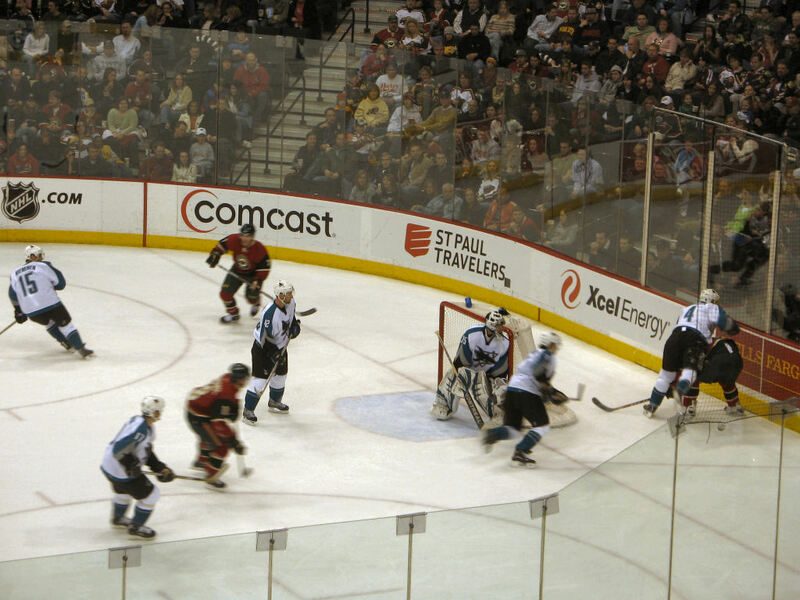 The slogan of the Minnesota Wild NHL hockey. 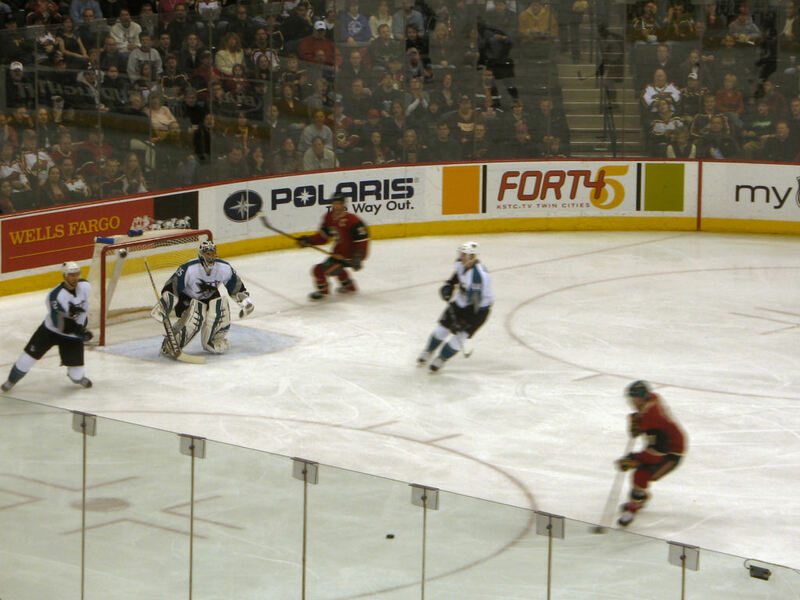 From the San Jose Sharks versus Minnesota Wild from March 25, 2006 at the Xcel Energy Center. Manilia Daily Photo posted a photo of 1 of 3 ice rinks in the Philippines. It brought a smile to my face and I wanted to share an ice skating photo in return. Saw this little girl walking in the water of the display art in the Nicollet Commons park in Burnsville just off Highway 13 and Nicollet Avenue. Was pretty warm out today and that must have been enjoyable for that little one. My seven year old son walked into the room I was in and says to me, "Dad, there is a duck in our yard". 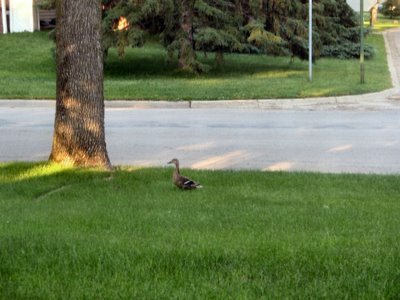 I thought he was kidding around, but I went to look and wouldn't you know it, there was a duck in our front yard. Very strange place for a duck to be in my yard considering the closest body of water is not all that close. My thought is this female mallard perhaps was looking for a place to lay her eggs. Not sure, but I was able to get this photo through my screen door before it walked away. 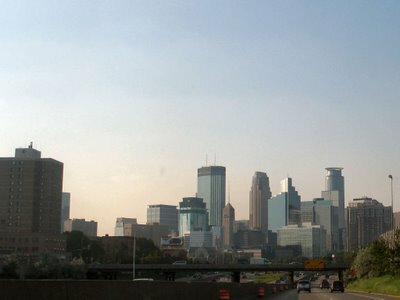 As your headed north out of downtown Minneapolis, looking to the west, you'll see this skyline on the outskirts of downtown. I like how the buildings are mainly silhouettes and you can't make out much of the building detail. 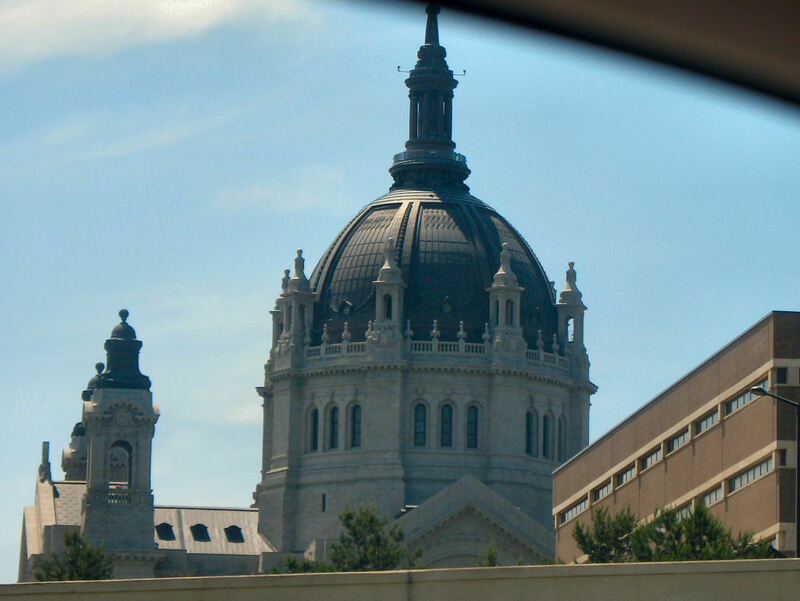 Photo of the Cathedral in St Paul. The fact that this photo turned out is amazing. It was taken while driving on Interstate 94 between St Paul and Minneapolis. I was driving, my wife who took the photo was in the passenger seat. She took the photo through my window and the result was very good. You can see part of my vehicle in the upper right. 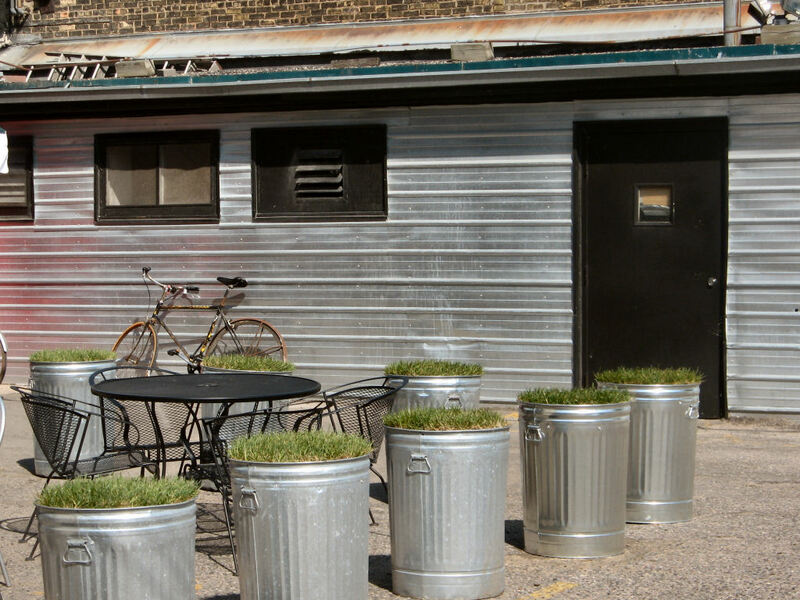 These 55 gallon garbage pails make perfect pots for growing grass. 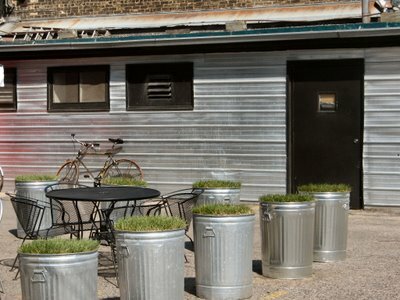 These are found in the outside seating area at Grumpy's. 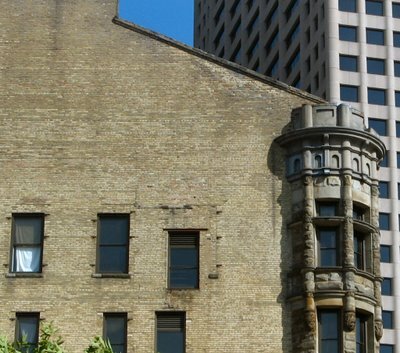 I believe it is on Washington Avenue in downtown Minneapolis. 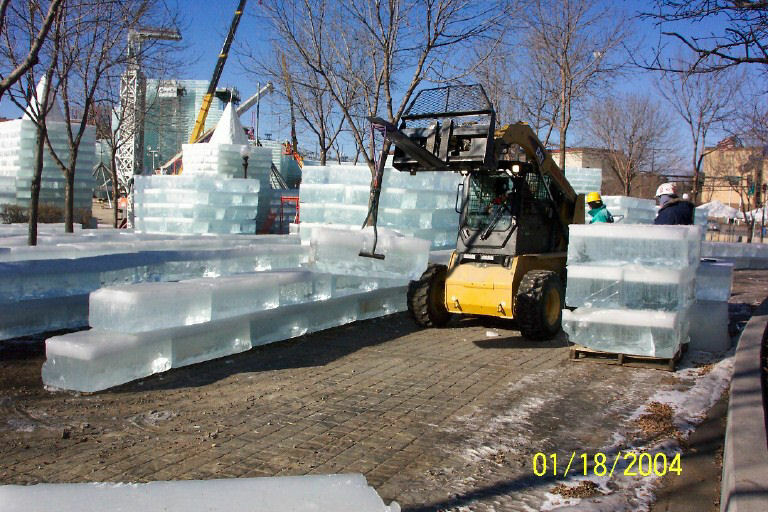 Another photo during the contruction phase of the Ice Palace that was made for the St Paul Winter Carnival in 2004. Showing how heavy the blocks of ice are. 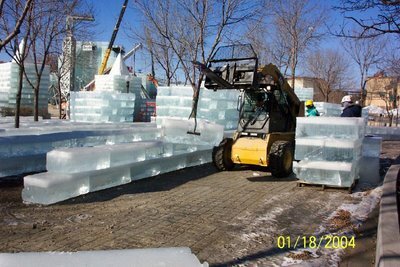 One must use macinery to move a block of ice this large. Right across the street from the building in the post below is their other building. Painted not quite as bold, but considering the size of the two buildings, they did a find job of blending the two buildings. Interesting enough, the two buildings are only painted on the back side. From the front of the buildings and the other two sides, they are as normal as can be. Who says one needs to advertise to get some attention? This is the ultimate attention getter. This building has always stood out when I see it. It's owned by Valspar I believe. 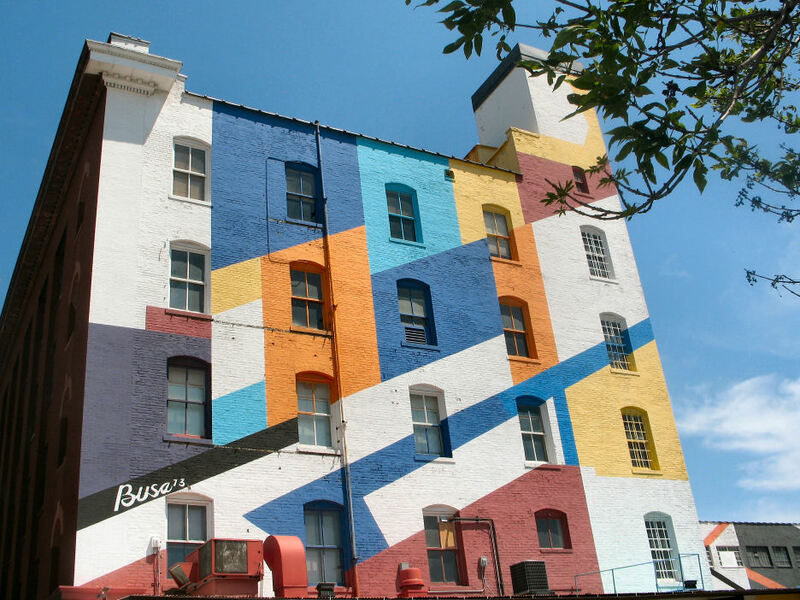 I like that they were very bold in painting the highly visible side of their building so boldly. It's visible when you take the 5th Street exit ramp off of Interstate 94 heading into downtown Minneapolis. This has got to be the most unique fire escape spiral staircase I've ever seen before. It's found downtown Minneapolis on 1st Avenue, I believe between Washington Avenue and 3rd Street, or it could be between 3rd and 4th Street. Whichever the case, it's not to be missed.